Praise someone dear for their virtues by gifting this Cute Teddy Surprise with Heart Shape Chocolate for Valentines Day that clearly states how special they are. 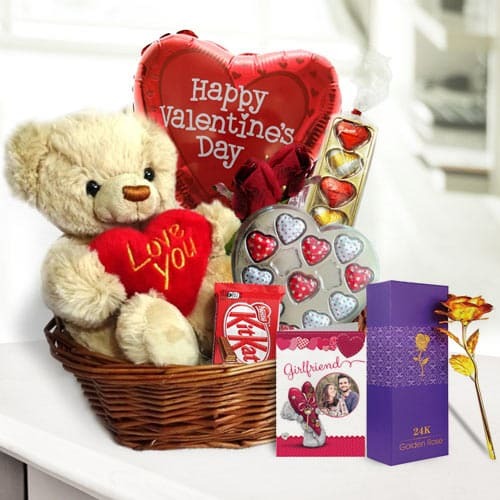 This Valentines Gift Basket contains an irresistible collection of Mylar Balloon, Love Teddy, 2 Pcs Velvet Red Rose, Golden Rose, 11 pcs Heart Shape Handmade Chocolate, 5 pcs Golden Heart and 6 pcs Kit Kat. All these items come in a decorated Basket with Special Valentines card.